The world is experiencing the emergence and rapid growth of the “sharing economy”. This poses significant challenges in different areas of law, including real property, personal property, taxation, contract and land-use planning. The New South Wales Parliament recently charged a Parliamentary Committee with conducting an inquiry into the adequacy of the existing laws regulating short-term holiday letting. In October 2016, the Committee produced a report detailing its findings and outlining a number of law reform recommendations. The New South Wales government is due to provide its response in mid-April 2017. This article identifies some of the key challenges that short-term holiday letting poses to the State’s planning law regime and explores a number of viable regulatory responses. It argues that the new model of short-term holiday letting regulation proposed in the report is unclear, risky and unnecessarily deprives local governments of the power to regulate what are principally local planning issues. 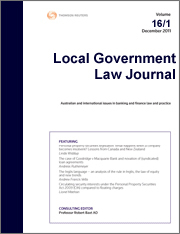 Instead, it is contended that the traditional, existing regulatory regime should be adapted to strike a better balance between regulatory clarity, certainty and consistency at the State level and vesting local governments with the discretion to regulate short-term holiday letting at the local level. For the PDF version of the table of contents, click here: LGLJ Vol 22 No 1 Contents.